Pav Bhaji is one of the most popular street food in India which comes in many tempting variations like Khada, Paneer, Cheese, Masala to name a few. We are always on the prowl to taste some lip-smacking pav bhaji around the city. Last time on our visit to Chatakk for Missal Pav, we missed eating Pav Bhaji, so planned to try our hands on it. Misal was to die for and so was Pav Bhaji. Chatakk Pav Bhaji is available only after 5:30 PM. Not a very jazzy menu the bhaji is of two types– Plain Pav Bhaji and Cheese Pav Bhaji, each served with finely chopped onion and lemon wedge to enhance the flavours. Pav are normal Indian bread which are baked in house and bhaji was coarsely mashed vegetables, mildely spiced, suitable for every palate. The spice level can be adjusted as per your choice. Cheese Pav Bhaji was sinful, divine with loads of cheese. One has to keep their diets on side and indulge in the wok of fully loaded cheesiness. Highly recommended. 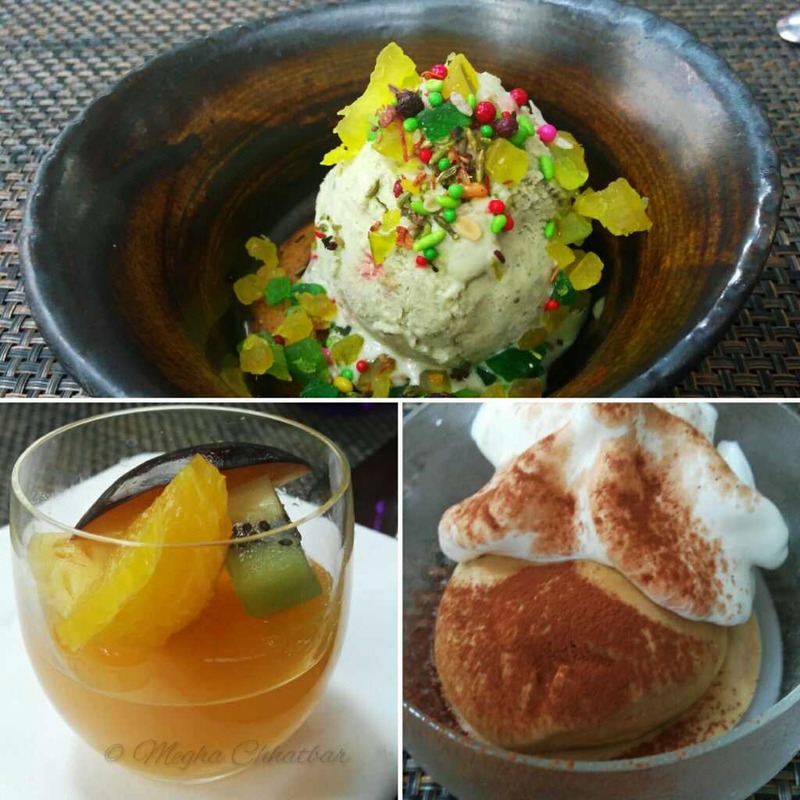 Pair it up the spiced Buttermilk or Malai Kulfi for best experience. I am surely going for it again! 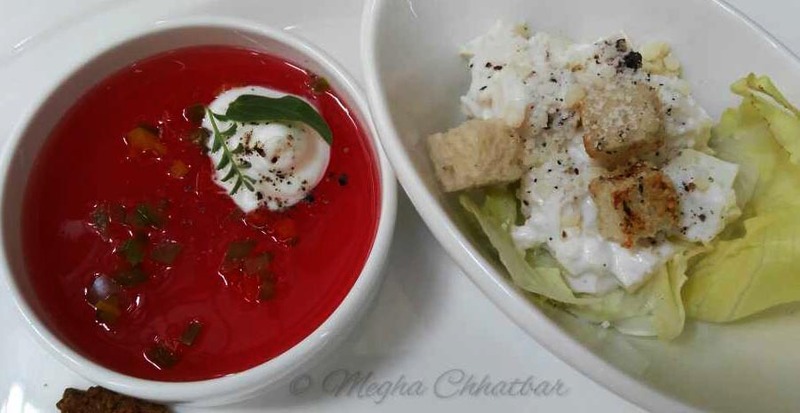 The Eatery– Four Points by Sheraton – Mango Magic Mania — Reviewed! Summers are here and the best part about it is Mango, yes! Being a foodie, I wait round the year to relive the nostalgic moments of life (all revolving around mango). And this fragrant summery season, mango is all over. I started with the usual lunch buffet having balanced veg and non-veg dishes. Had fried Wontons and Cauliflower fry for starters. Wontons were crisp, filled with cottage cheese and served with fresh mint chutney. Not big fan of cauliflower so had to skip this. Main course had creamy Malai Kofta, Paneer, Jeera Aloo, Breads, which tasted delicious. Desserts had a nice spread of pastries, brownies, icecreams. But I was eagerly waiting to treat myself with the mango delicacies and here they were. Out of the above mentioned menu, I tasted two of them and they were just WOW! Fresh Cut Mangoes with Mascarpone - Diced sweet and tangy mangoes drizzled with creamy mascarpone were refreshing. The aroma and taste of mango was divine. Tangy Alphonso Cheese Cake - It looked so appealing. Cold Cheese cake with Mango chunks & Lemon beautifully prepared with chocolate carving. Totally sinful! Scorching heat lead me to try something chilled. Could not even think of so creative, refreshing mocktails. Aniket, the bar manager, made sure to surprise us with the drinks. Started with fruity mocktail, a captivating name, Ms Scarlet, had delicious concoction of strawberries, orange and a hint of fresh mint. One of my favourite! We slurped our chilled Slushy Mango mocktail, a good combination of fresh mango, mint and loads of crushed ice. Mocktail with a thai twist!? Sound interesting! Tasted good too. Thai Mango Cooler, a good mix of mango juice and thai herbs and spices. Classic Mojito mixed with fresh mango juice and fresh garden mint leaves was reinvigorating! 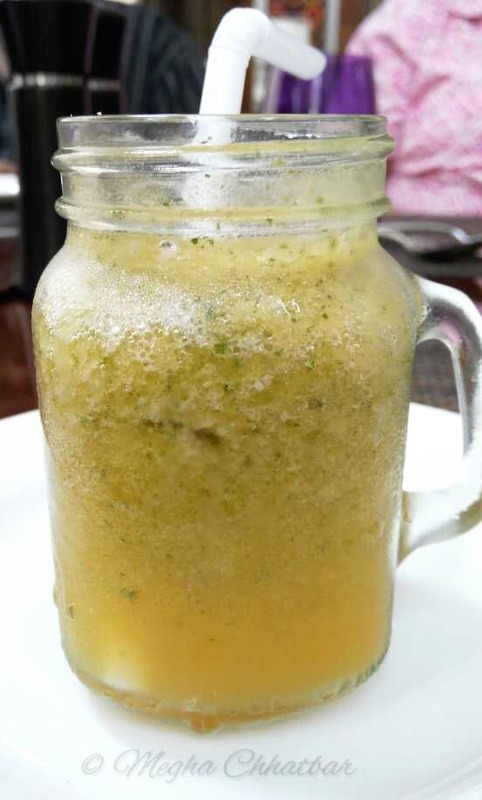 After tangy and sweet drinks, I wanted to try something spicy and was presented with Spicy Mango mocktail–a special mocktail with spicy flavours of green chillies in mango juice. The drink was piquant and balanced.Totally appetizing! Overall, a memorable lunch with loving Reena. Do not forget to visit and indulge in the Mango mania and share your experiences in the comment below. Three different style restaurants– Koji, Asian speciality restaurant; Masu, Asian inspired bar, Zeera, restaurant offering North Indian cuisine and Coriander Kitchen, a multi cuisine one. After a good 45 min. tour, we moved to Coriander Kitchen and the lavish lunch buffet was awaiting for us. Few highlights were..
Food Library will certainly catch attention because of very innovative concept of food presented as sampler alike keeping books in library; where one can take a glimpse and go for more. Desserts, chutneys, hummus, salads were showcased in food library. I like it more as it curbs food wastage. The buffet spread was a balance of veg and non-veg dishes and one can enjoy their food on comfortable seats. Our lunch had a mix of buffet and A La Carte. Chef Mandar made sure that the signature dishes are served right on the table. Started with mango cooler – chilled and refreshing. 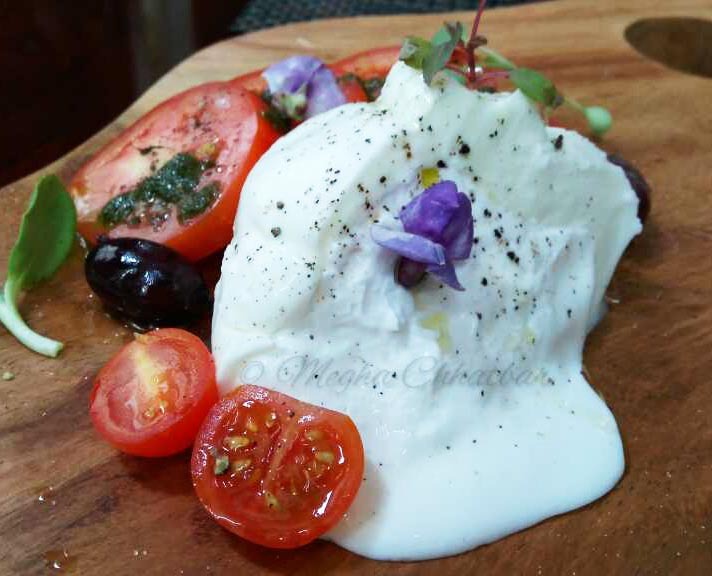 Fresh, cheesy, gooey Burrata with tangy cherry tomatoes and olives were served to balance the sharpness. 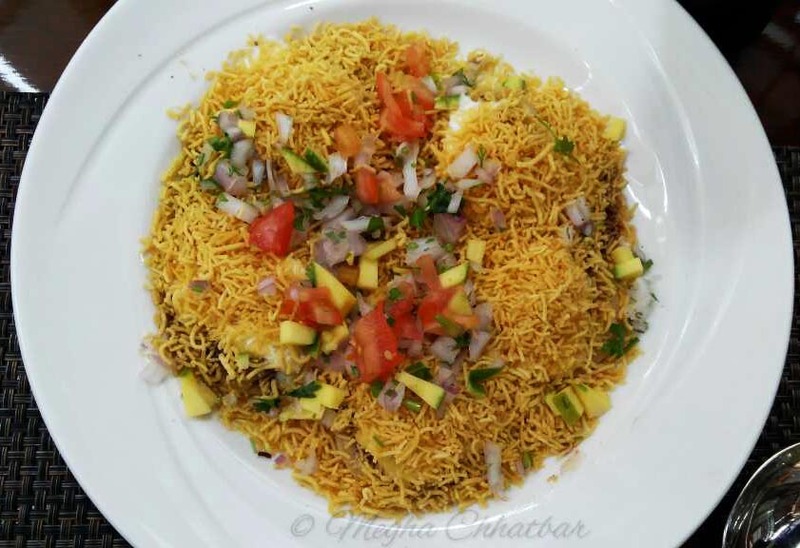 I can surely say, one of the best Pani Puri, Sev Puri and Dahi Puri I had in Pune was at Conrad. 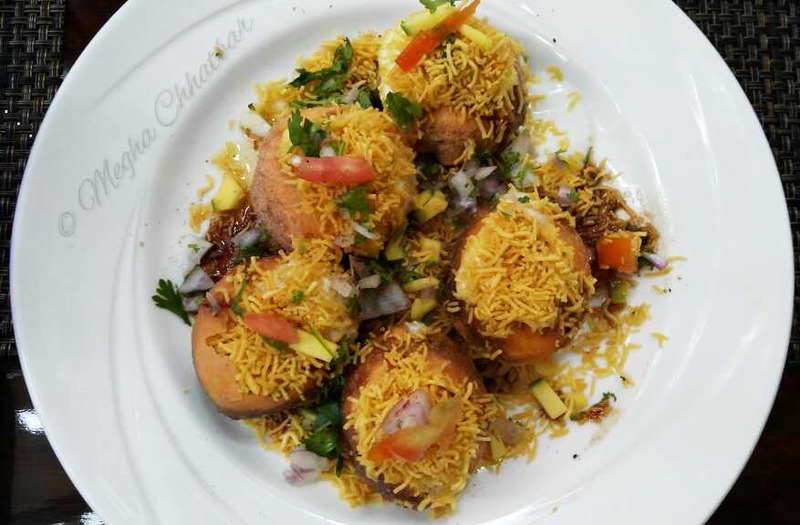 Order from the live chaat counters and relish on your tables. One bite and burst of all tangy, spicy, sweet flavours in your mouth. Highly Recommended! Watermelon Jelly with Feta was different had wobbly texture and tasted good. 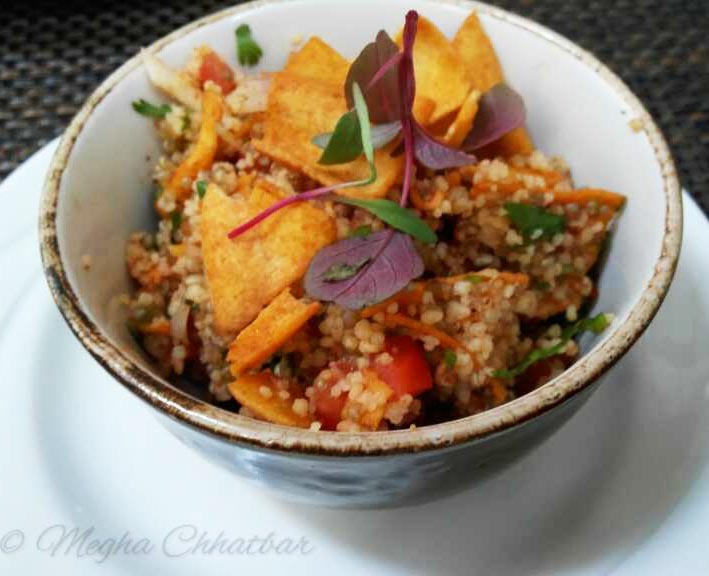 Quinoa Salad was one of my favourite dish–healthy, tasty with a 'desi' twist. Quinoa was cooked to perfection with a crunch of papdi and dash of lime juice made it irresistible. Recommended! Hara Bhara Kebab had rustic plating on a slate with tangy green chutney. 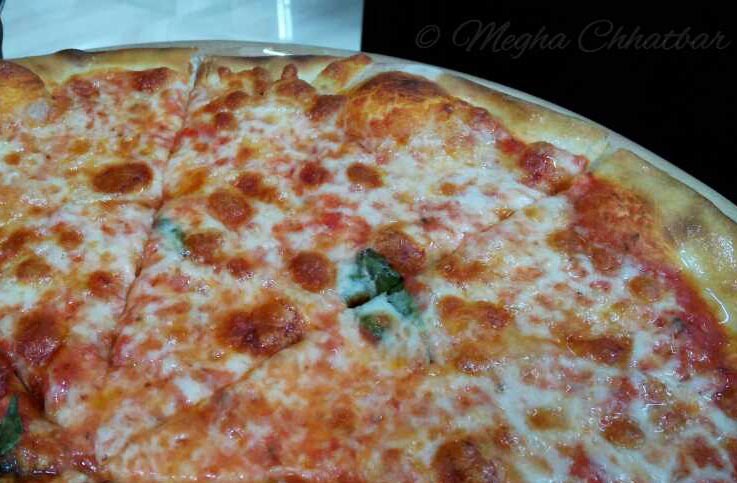 Thin crust margarita pizza was next on table and trust me, superb delectable it was. Chef Mandar and his team surely have magic in their hands. 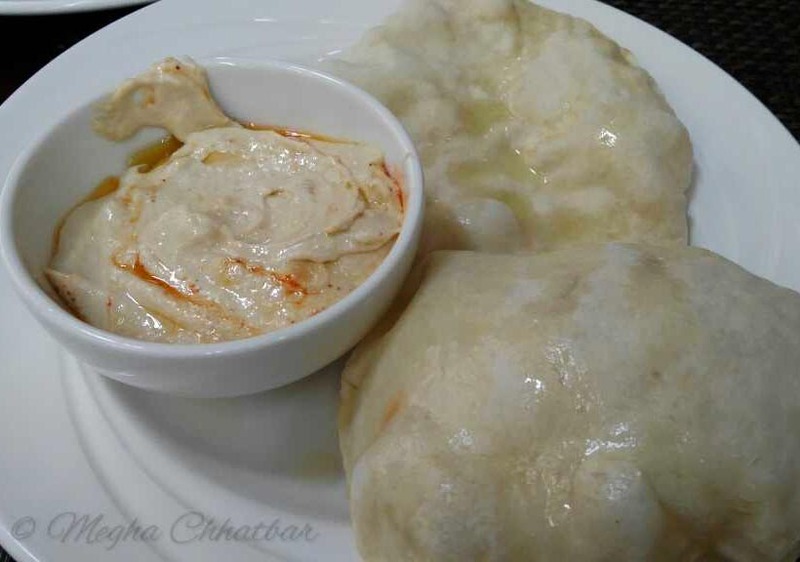 Freshly made Pita bread in-house was one of the best I had in town. Soft, fluffy bread tasted great with hummus which was equally delicious. Highly Recommended! Desserts had again so many choices from pastries to ice creams to waffles , but I settled with the signature dishes–Paan Icecream, Filter Coffee Icecream, and Fresh fruit salad. Paan Icecream– After-dinner treat and digestive too. All the goodness of paan is infused in an ice-cream and topped with gulkand, mints, green cardamom, fennel seeds. Best! Filter Coffee Ice-cream– The rich filter coffee flavour was best and balanced combined with the icecream. Recommended!